Are Roof Access Stairs and Walkways Really Extras? maybe you’re the owner, and you just signed the check. Either way, you might be reluctant to spend even more money on “extras.” But things that extend the life of your roof and protect your workers aren’t extras; they’re the basics. Along with rooftop walkways, roof access stairs definitely fall into that category. Let’s take a look at why that’s true. Rooftops may not be designed for foot traffic, but that traffic is a fact of life. All rooftops need maintenance at some point. Even brand new roofs need to be inspected regularly. Unless you’ve got a drone to do a flyover for you, maintenance workers will need to check things out in person. And older roofs need both preventive maintenance and repairs, which is another reason workers will at some point need to be on the roof. All of that foot traffic can really add up over time, causing serious wear-and-tear to the roof. Equipment needs to be maintained, too. Not only will the roof itself require maintenance, the equipment that’s on it must be maintained, too. Whether it’s routine maintenance on the HVAC system or checking pipes and pipe supports for damage after a big storm, rooftop equipment further increases the need for foot traffic. Rooftop equipment can restrict access. Between things like HVAC equipment, antennae, pipes and pipe supports, and equipment and equipment supports, satellites, solar panels, and vents, the typical commercial rooftop is crowded with equipment. That can make access to certain areas of the roof challenging for maintenance workers, whether they need to work on a piece of equipment or on the roof itself. Without roof access stairs, they’re going to have to find another way to go over, under, or around any equipment that’s in the way. And that presents a number of problems. Not only does stepping on and climbing over equipment often lead to damage, it’s also dangerous. Workers are at risk of injury not only from slips and falls, but from things like hot equipment and sharp edges. 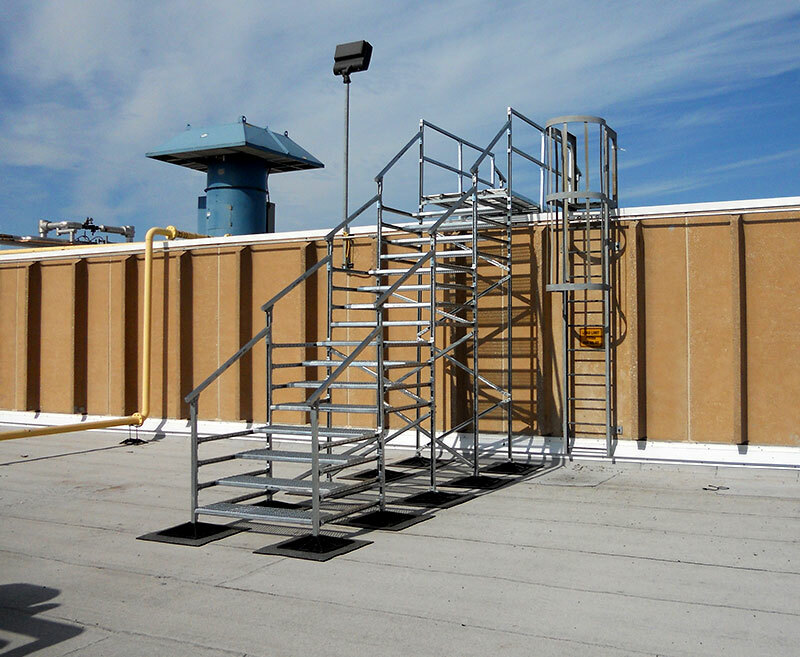 And, while bringing scaffolds and ladders to the roof may make access easier, they increase the risks of falls. In addition, they can puncture the surface of the roof, leading to expensive maintenance costs. More and more buildings are opening the roof for reasons other than maintenance. Fueled by the sustainability movement and the need to optimize all available space, more and more companies are opening the roof to all employees, and sometimes to the public. Green roofs, especially, lead to more foot traffic, as people visit the roof to appreciate the many varieties of plant life that can be found on a typical green roof. Walkways provide a physical buffer that protects the roof from direct contact with foot traffic. Walkways also encourage employees to follow approved pathways rather than walking all over the roof, thereby limiting foot traffic on other areas. 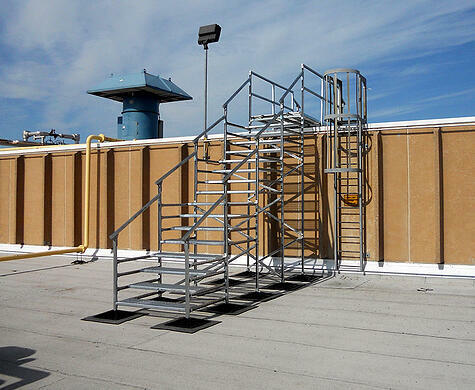 Walkways and roof access stairs help maintenance workers avoid falls, slips, and other injuries. They also help protect other employees by providing a clear path for anyone who might not be trained in roof safety. Stairs provide safe, convenient access to areas of the roof that might otherwise be obstructed by pipes or other equipment. Stairs eliminate the need for ladders and scaffolding that could puncture the roof’s surface. A new roof is expensive, especially if you’ll also be installing equipment on it. It’s only natural to want to avoid unnecessary costs. But rooftop walkways and roof access stairs aren’t “unnecessary.” They’re critical for the life of the roof and the safety of your employees.